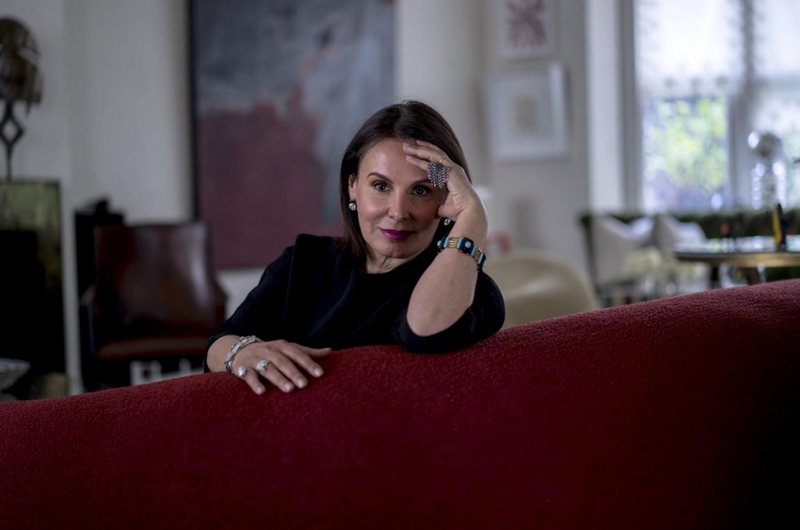 LONDON — Terry de Gunzburg’s jewelry collection is as original as she is. 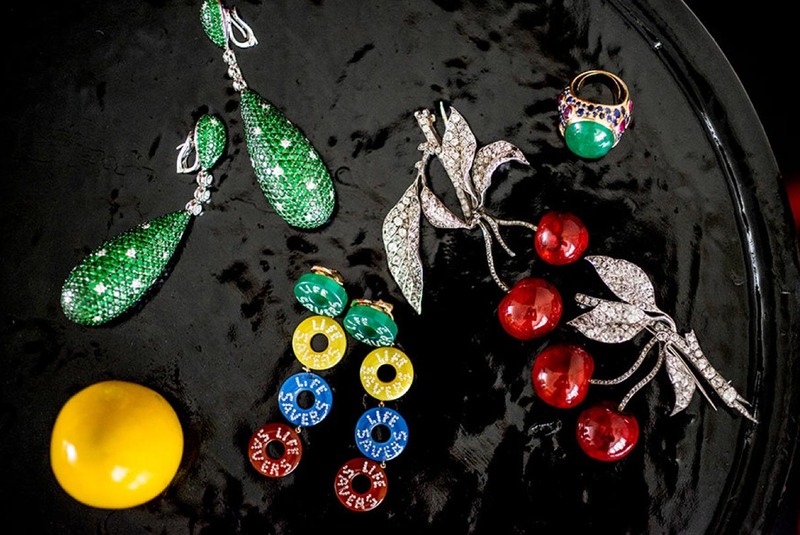 There are diamonds, emeralds, sapphires and rubies, but the creator of the By Terry makeup and beauty lines also has brooches of enameled cherries, earrings of agate Life Savers and titanium bangles. Pieces from great names such as Cartier, Bulgari, Codognato, Tiffany — and a pair of ruby and diamond chandelier earrings believed to have belonged to Catherine II of Russia — are complemented by bespoke contemporary compositions from the Swiss artist Suzanne Syz; the New Zealand-born, London-based Jessica McCormack; the British designer Solange Azagury-Partridge; James de Givenchy of Taffin in New York; and Elie Top in Paris. The Big Ben earrings by Suzanne Syz are white jade discs with diamonds, white gold and titanium. Ms. de Gunzburg wore them, paired with a vintage YSL couture tuxedo, to a 60th birthday dinner for Prince Charles. “The collection is not me, it’s Jean,” Ms. de Gunzburg said of her husband, a research scientist who grew up in Right Bank Paris, his family part of a European banking dynasty. “He adores jewelry and antique things from his family, like this diamond brooch in the shape of a flower with curving stem and leaves,” she said, indicating one of the pieces she had laid on her dining room table under the glimmer of an 18th-century Venetian chandelier. Ms. de Gunzburg’s jewelry really is just another intriguing element in a creative life. In 1978, she left her medical studies behind to train in beauty with the renowned Carita sisters in Paris and became a makeup artist in demand for fashion photo shoots. Then she moved into the creative nucleus around Yves Saint Laurent. As creative director of YSL Beauty from 1985 to 2000, Ms. de Gunzburg introduced a pen-like highlighter “Touche Éclat,” still a YSL best seller. During an interview there one early spring afternoon, dressed in Prada black slacks and sweater, pepped up with gold Prada espadrilles, she said she was happy to admit to being 59. But who wouldn’t look forward to birthdays, when, like anniversaries, Valentine’s Day and even the advent of summer, the occasion always brings a gift from her husband. “I like surprises,” she said, describing how he proposed in the middle of the Place de la Concorde. “He stopped the car and caused a monster traffic jam,” she recalled with a laugh. Brushed gold spiral pendant earrings by Man Ray, similar to those worn in a 1968 Man Ray photo of the French actress Catherine Deneuve, were one birthday present. “I wore them to a Gagosian dinner to celebrate a Picasso exhibition in London,” she said. The unusual “Big Ben” earrings by Ms. Syz were another. 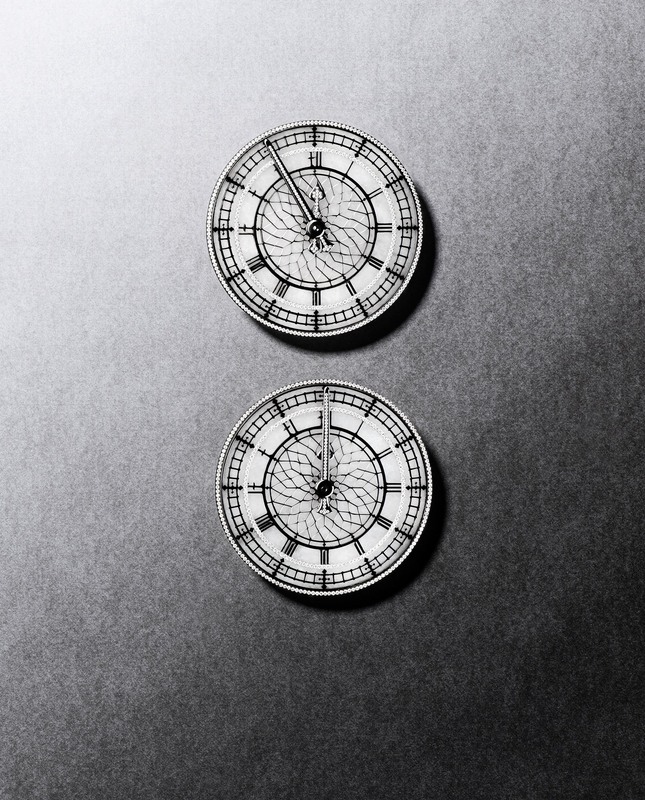 Their design, a composition of white jade discs, diamonds, white gold and titanium, echoes the clock face at the Houses of Parliament in London. Ms. de Gunzburg wore them, paired with a vintage YSL couture tuxedo, to a black tie dinner at Buckingham Palace to celebrate Prince Charles’s 60th birthday. What she called her “everyday jewelry” includes a 1925 Cartier platinum and white diamond bracelet with small round-cut and baguette diamonds and tiny sapphires and a 1920 Cartier diamond and platinum watch that she wears as a bracelet because “none of my watches work,” she said with a smile. Go to previous slide Go to next slide Some of Ms. de Gunzburg’s pieces were inspired by costume jewelry styles. Clockwise from the yellow ball, a feature of the Joan Miró stool used for display: peridot pavé and diamond-star drop earrings from the Swiss jeweler de Grisogono; a cabochon emerald ring in gold dotted with small rubies, diamonds and sapphires, by the French designer Suzanne Belperron (“I wear it in the daytime, like costume jewelry”); twin enamel cherry brooches with diamond leaves, attributed to René Boivin of France; and Life Savers earrings, by Ms. Syz, created in agate with the candy’s name spelled out in diamonds. An old-mine, cushion-cut diamond, with a contemporary white gold mounting with diamonds by Ms. Syz, shone on the little finger of Ms. de Gunzburg’s right hand. And her earrings were more old-mine diamonds from the turn of the century that Jessica McCormack, whose Mayfair boutique is a favorite, had set in oxidized sterling silver and 18-karat yellow gold. Ms. de Gunzburg pointed out other favorite pieces to guests: Ms. Azagury-Partridge’s “Belly Dance” ring, made of tiny diamonds on a fringe of blackened white gold, and what she calls “my lucky charm,” Ms. McCormack’s “New York” ring, which uses French-cut, bullet-shaped baguette diamonds to evoke Manhattan skyscrapers. Then there was a Christmas present: a Cartier tutti-frutti bracelet with a mosaic of sapphires and baguette diamonds with tiny emerald and ruby holly motifs. And when she went to bed that night, he had placed on her pillow a pair of Cartier tutti-frutti sapphire, diamond, ruby and emerald platinum chandelier earrings. Ms. Syz’s whimsical Life Savers earrings, agates in yellow, green and blue and two in coral for Ms. de Gunzburg, combine costume jewelry pizzazz with real stones. When the de Gunzburgs asked her to create a setting for a pear-shaped diamond, the artist set the stone off-center in a looping white-gold band of tiny diamonds. “I wanted the result to be funky and fun,” Ms. Syz said. One of Ms. de Gunzburg’s most personal pieces is a pavé emerald and diamond gold pendant from the 1970s that was a gift from her grandmother. Their shared love of jewelry reflects an affinity that often seems to skip a generation. 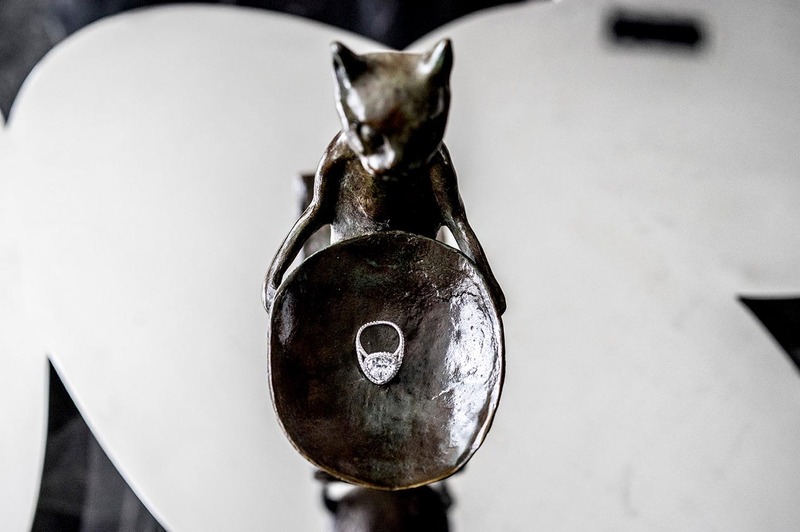 A bronze cat sculpture by Diego Giacometti holding the cushion-cut diamond that Ms. Syz put in a contemporary white-gold ring. “My mother wasn’t interested,” Ms. de Gunzburg said. “My daughters don’t care, but Elsa, almost 6, and Victoria, 2, love to dress up and play with my collection.” The proud grandmother said the 2-year-old loves everything in gold, so her favorites include a Bulgari jeweled chain and her Lalaounis and Zolotas bracelets. Elsa, however, already has her eye on the Syz diamond ring her grandmother wears all the time. A version of this special report appears in print on May 14, 2015, in The International New York Times.